Takahashi Minekichi was a rural Japanese strawberry farmer with a vision. 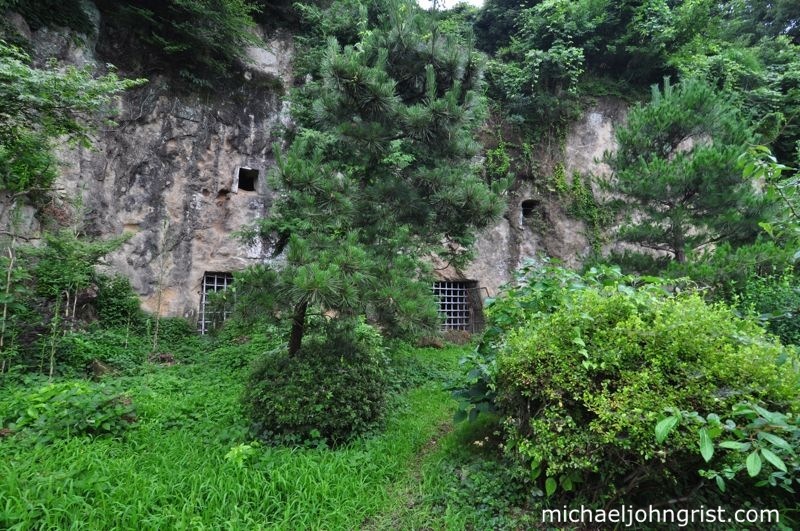 For 21 years he carved the beginnings of a grand hotel into the solid rock wall of a cliff face on his land, digging out the contours only he could see. He did it all alone, using only a chisel, until the day he died in 1925. It was never completed, and no rooms beyond the lobby and kitchen/shrine were ever dug. No-one ever stayed there, but still it remains to this day, thoroughly fenced off and out of bounds. Inside the Gan Kutsu cliff face hotel, grand staircase. The last time I came to the Gan Kutsu hotel was with SY, you can see that post here. It was completely blocked off, with no gaps or breaks in the metal grilles covering the several entrances. 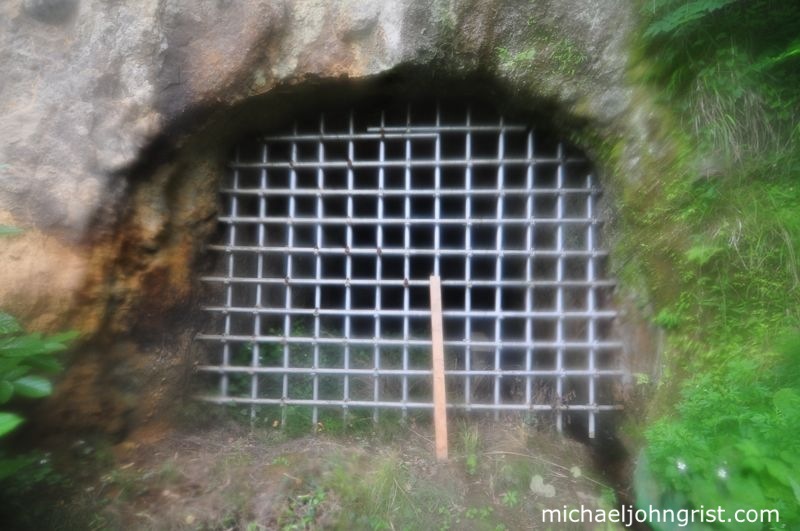 We didn`t even climb the outer fence, just admired Minekichi`s handiwork from the outside. For the longest time since I`ve wanted to go back, climb the outer fence, and just make 100% sure entry was impossible. This past weekend I did just that. It was the last time for me to haikyo with Mike and Scott together, as Mike is soon leaving to go study graphic design back in Canada. We`ve been on so many haikyo together, and together witnessed our interest in the hobby change. In the early days any kind of location was intensely exciting. Hotels were great. Factories were awesome. After going to plenty though, the attraction changed. Hotels and factories began to all look much the same. The spark of excitement that exploring them brought had been dulled by familiarity. So I rolled out the Gan Kutsu hotel; a truly unique and virtually unexplored ruin. We would not be shy or skittish about it. We would without a doubt climb the fence and reconnoiter the door-grilles. We would take shots through the bars. We would try to climb up to the open windows. And if we failed, we`d know we`d failed trying to do something cool. If the local police came to shoo us off, fine, we`d take it. It`s hardly a US Air Force Base, I doubt they`d do much other than send us on our way. The wooden boards here are obscured. We didn`t want to hang around shooting in front because we didn`t want to attract too much attention. We approached in the rain, Mike and Scott teasing me for my prediction `it`s about ten minutes walk from the station` repeatedly. I guess it was more like half an hour. We crested the rise to the bridge and saw the hotel over the river, its forecourt much thicker with summer growth than when I visited last time. My first thought was- `good cover`. My second thought, as we got closer, was one of jubilation- someone had smashed in the wooden pallets blocking the smallest entrance, meaning entry was completely within reach. My heart sang. I`d always thought those wooden boards were a weak spot, and while I wouldn`t have smashed them in myself (just too dangerous to do so in the middle of the day), I might have had a go at quietly prying them loose. But, no need, it was already done. Out front there was very little foot traffic. We strafed the front fence once, noting the weak spots. It had one small area without barbed wire, right next to the main gate. We planned a commando-like assault, one by one, until Scott noticed the lady sitting inside the ice cream parlor across the way, who had a clear line of sight towards us. We hovered there for a moment, and she must have been wondering what the heck we were up to. We retreated out of sight and plotted. Could we go under the fence at another point? Would we abort? The only other feasible possibility seemed to be round the side where, sheltered by overgrowth, we could attempt to clamber up the cliff itself and over the fence. It seemed ropey for a while, the vegetation too thick, the fence too high, but with persistence we were soon all up, over, and squeezing through the gap in the wooden fence. 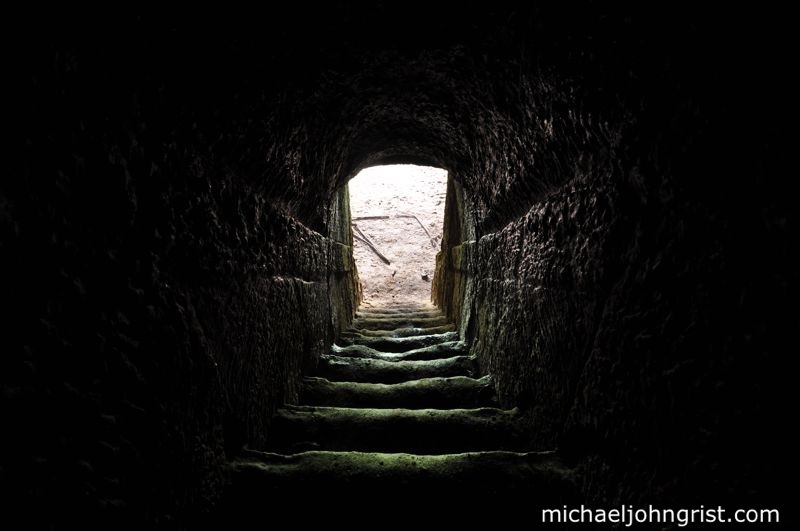 Inside, the narrow passageway went back for about 10 meters. To the right was a long thin staircase (carved into the rock) heading up. 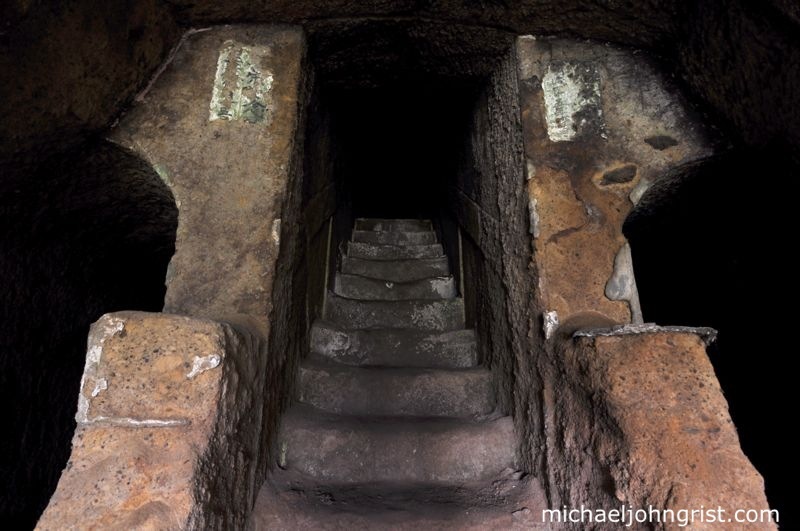 I logged the stairs for later exploration and headed deeper, flashing my torch beams along the walls. When I noticed the ceiling it gave me a start- there were dozens of big brown cave crickets clustered inches above my head. For a moment I freaked out, terrified one would drop onto my head, then just forced myself to not look at the anymore. It worked. 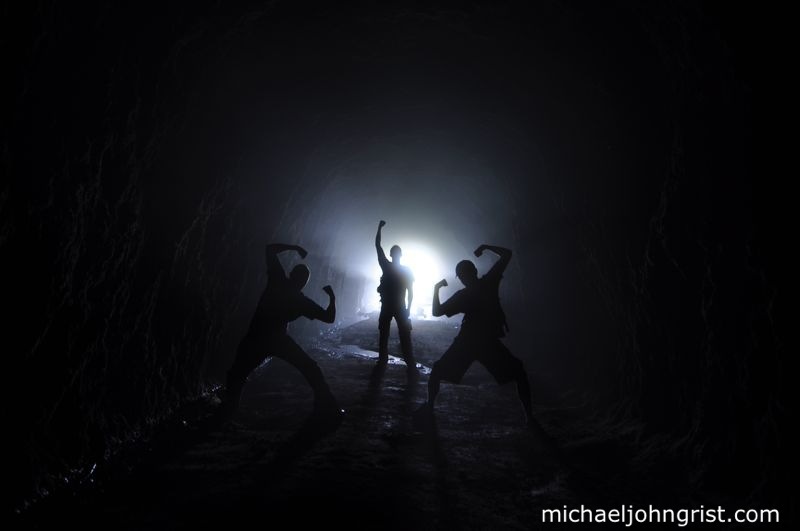 Cave crickets. Some of them were pretty huge. From there we explored. The lobby was large and airy, lots of light coming in through the wide-open grille entrance. The stone-work in places was ornate, with flourishy rolls carved into the rock. It must have taken Minekichi years just to hollow out this space. I can imagine him meticulously measuring, shaving millimeters of rock at a time, envisioning the lobby as it would be. The grand central staircase ascended into darkness, and I reserved exploring it til the end. The next room over seemed to be some kind of shrine, or possibly kitchen, with lots of shelves carved into the wall and a sink-like area. The feeling in there was wonderful, with light shafting in through the grille and tinted with the greenery over the front. Looking out of the grille of the lobby. One of the side corridors leading off the lobby, showing traces of decorative wall-paper/plaster. Stone shelving. Are these slots for little icons/gods, or for storing ingredients? 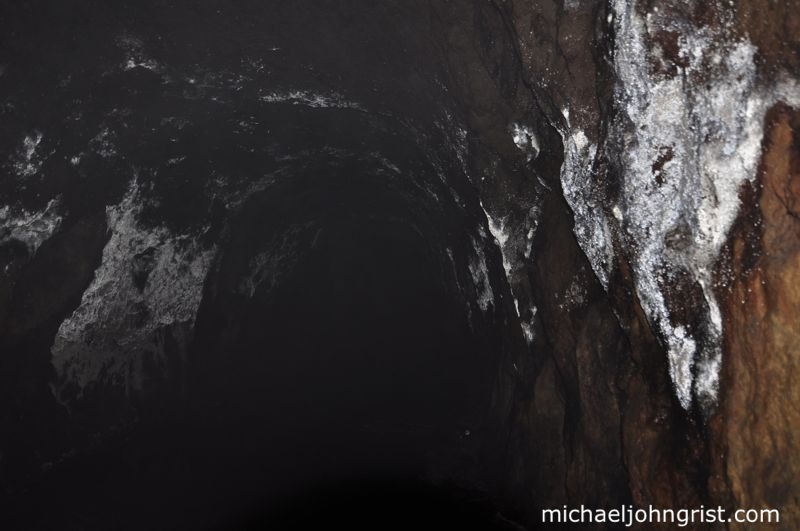 After that we headed deeper, into a huge open cavern that was completely black inside, and extended further than our combined flashlights could delve. 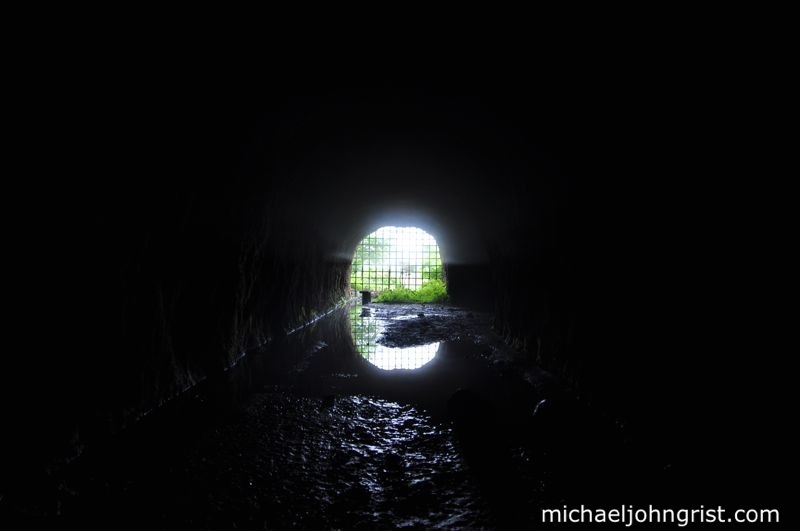 There were two benches in an observation area, a railing, then a long waterlogged hall stretching into the dark. That the strawberry farmer had somehow carved all this seemed impossible- perhaps more likely he stumbled upon an existing cavern in the rock. Lights and cables had once been strung up along the ceiling, but now hung down and caught the glare of our flashlights in the distance like hovering ghosts. 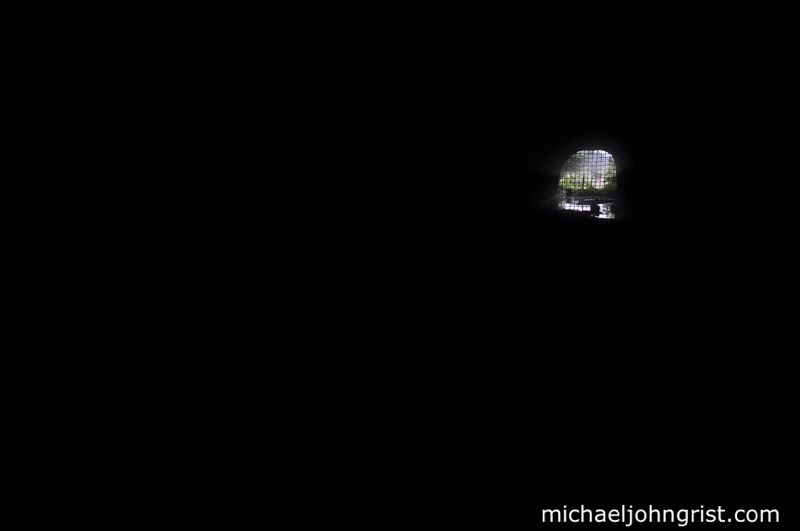 I took video of this part, which is all just us flailing in the dark, in awe at the size of the place. See that at the end. Part of the huge size came from what must have been World War 2 tunnels. These started to the right of the hotel itself, though were connected by a single metal door set into the stone. These are much larger than the human-sized passageways Minekichi carved- instead they were a broad and tall smooth semi-circle in shape that could easily accommodate cars, perhaps even small tanks. 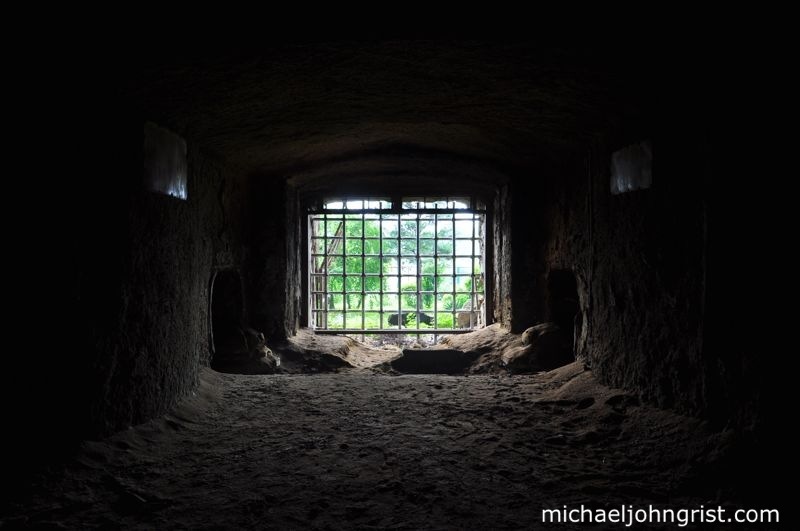 There were no rooms as such, just tunnels, and presumably they were used as secure (from bombing runs above) warehouses for munitions and vehicles, just as they were at the nearby Hyaku Ana cliff tombs. 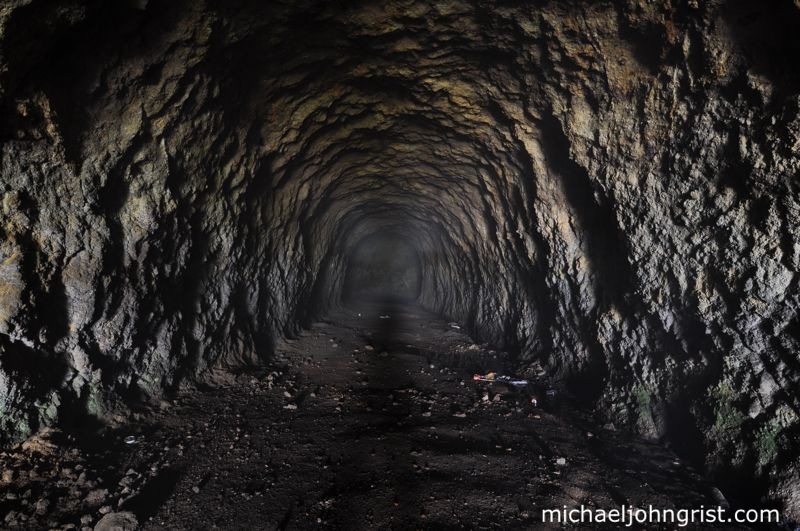 We ventured into the depths of these tunnels, finding dimly glowing lichen and lots of puddles to step in. Into the cavern. At the end there`s a T-junction, with both wings heading off into the black watery distance. Me on the left, Mike central, Scott right. After that we began to finish up. I headed first to the grand staircase in the lobby. I ascended with bated breath, only to discover that at the top, my way ended in solid rock. Evidently that was as far as Minekichi got. The rooms and corridors that lay ahead only ever existed in his mind and were never realized. The view down from the dead-end at the top of the grand staircase. The second staircase, the one I`d logged first, led up to the windows and balcony overlooking the courtyard. As I climbed, one of the cave crickets dived onto my head, which you can imagine freaked me out. I hung motionless for a moment, dreading a mass stampede of the colony located just above me. No more came though. 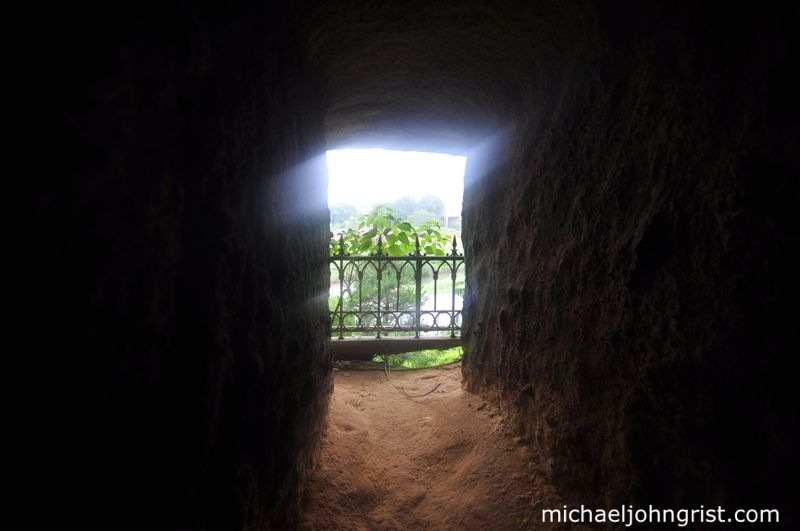 At the top there was only a narrow corridor linking the windows, and nothing else. I tried to shoot the place well, but after the frozen depths of the inner caves, my camera lens was condensing the humid air like crazy. Resultingly every shot came out blurred, though some of them in a neat way. One of the blurry grilles in the rain. So, that was the last haikyo trip with Mike. I`ll admit, it is getting harder to find cool places to go explore these days. 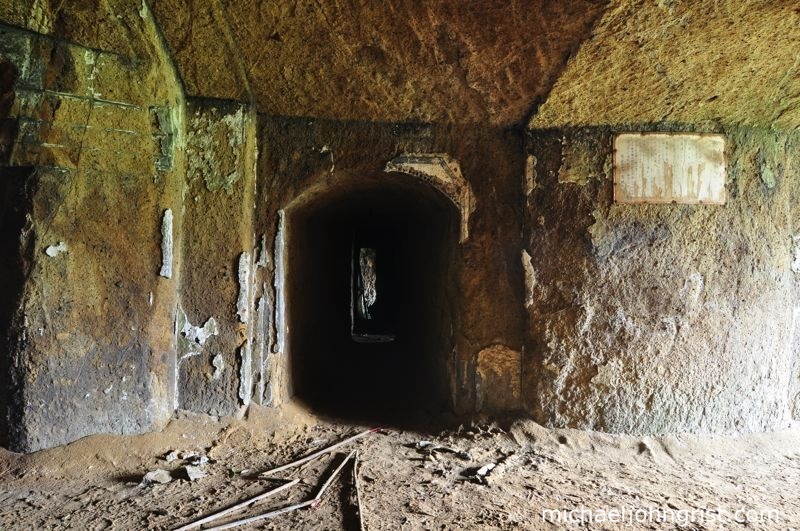 Perhaps in Hokkaido, Shikoku, Okinawa, there are as yet undiscovered bounties of ruin. I`ll have to work on it. Cliff Hotel Interior from Michael John Grist on Vimeo. Awesome post Mike! 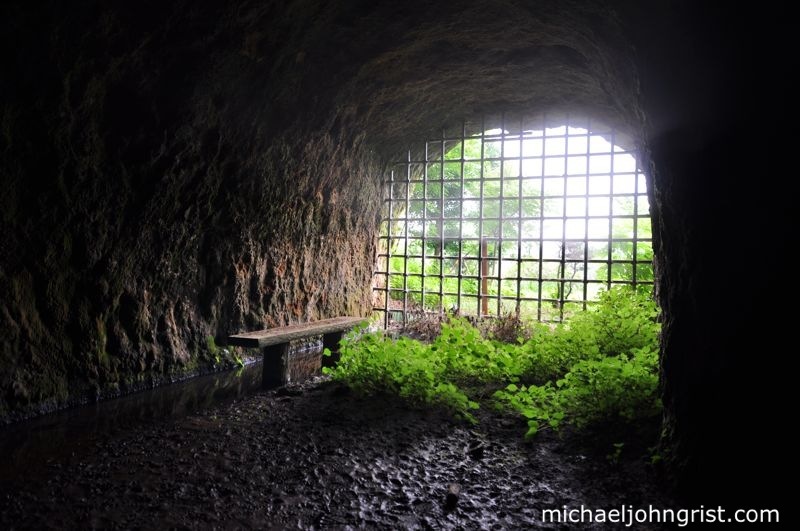 I found a secret cave haikyo myself recently. It really makes a change from the surplus of hotels and grey factories, doesn’t it? You’ll have to come over to Nagoya sometime. 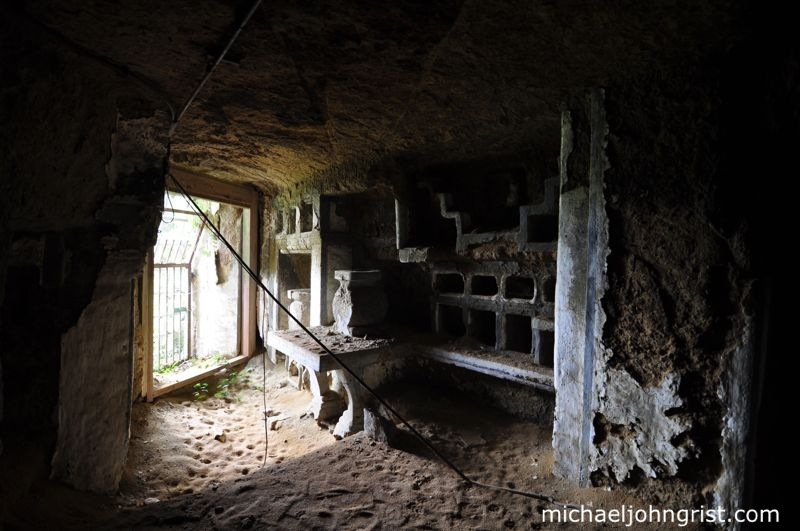 The Shiraishi Mine is a fascinating place with a lot of character that might re-energise your interest in the explore :). Nice nice! Fun time Mikey. Your pictures and recap of the afternoon bring a lot of life back to this haikyo. Looks like you were able to find one last good (local) haikyo to send the Can off. And got a photo of all you guys to immortalize it. …and have a friend with leads to more when I have the time to do some personal shooting as weddings and portraits have taken over for June/July. Now that you’ve braved the Gan Kutsu, we can call you the Gankutsu-ou! That’s very nice, exiting, and well described. I also like the fact that you have many shots of the locations, and even one of these terrible crickets:). Good job, and thanks for sharing. Mike- Cheers, and I just checked out your secret cave post too- great find! I’ll have to get to Shiraishi mine sometime. David- Right, and all the more so because many of the hand-carved tunnels were quite short, and we had to duck through them at times. Whether they were wide enough for burly dwarves to pass through though, I don’t know. Scott- Cheers, and I was really glad you could come for our last haikyo with Mike. Jason- Yeah I occasionally hear of abandonments in Florida that would be good- shut down airfields, beached ships, stuff like that. I think there’s got to be lots. Probably out in the Everglades many old hunting cabins and the like. Shii- Thanks, I’ll take it ;). 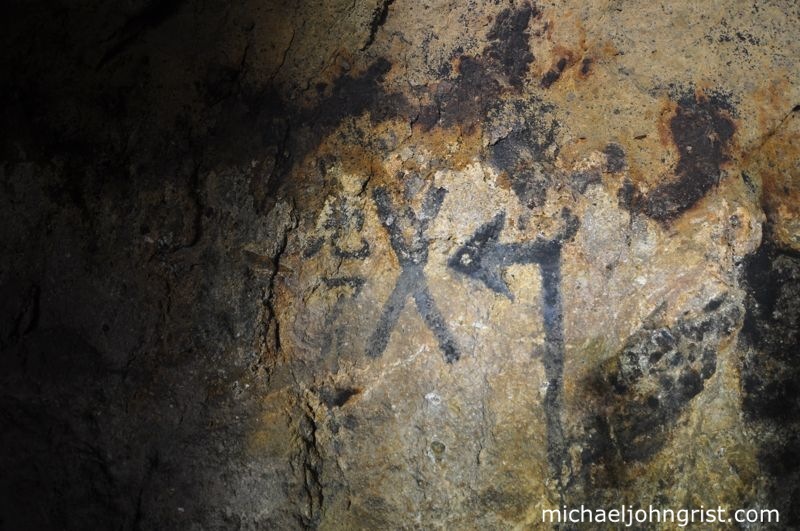 For those that don’t know- it means ‘King of the Cave’. Wikipedia tells me it was the name of a ‘Count of Monte Cristo’ manga. Mathieu- Thanks, I only wish I’d made the effort to change lens and get a better shot of the cricket. It was so dusty in there though I didn’t dare take my camera apart for it. Florian- I know, my friends are sick of hearing me say- ‘ok, I think I’m done with haikyo now’. As long as there’s new stuff to see though, I guess I’ll seek it out. As for coming to Kanto- we should do an exchange: I’ll connect you with Kanto locations if you give up the goods on Kansai. Deal? Yeah we’ve had some good times eh? Some other things that stood out (besides the ones you mentioned on my site) were sleeping over at the Russian Village with Scott and Jason, getting cussed out by the construction foreman at Kappa Pia and meeting those cosplay models in Ibaraki. It’s the end of an era maybe! Hope you can continue on longer though. Hokkaido and Shikoku are waiting for you! Love it Mike, that’s what it’s all about right? 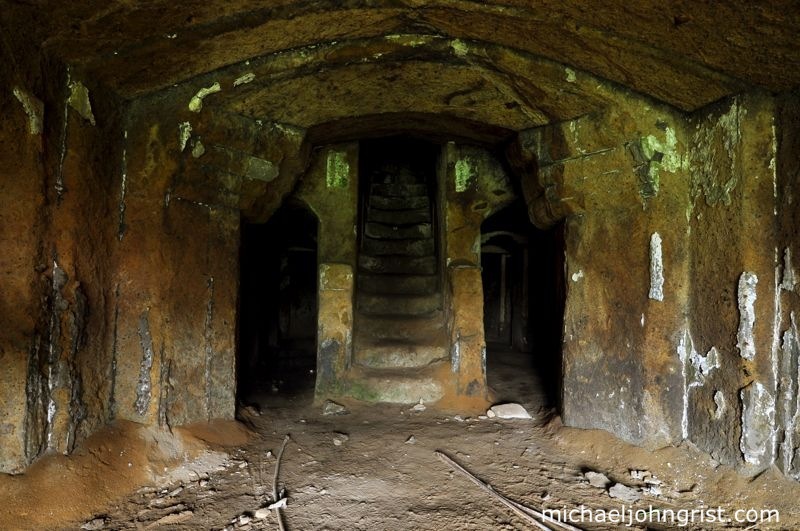 Caves, crickets, unknown, weirdness of humanity? Very awesome! That is absolutely creepy! I don’t know where you get the courage from to explore these places (maybe your buddies? ), but I would be terrified to set foot in a place like that. 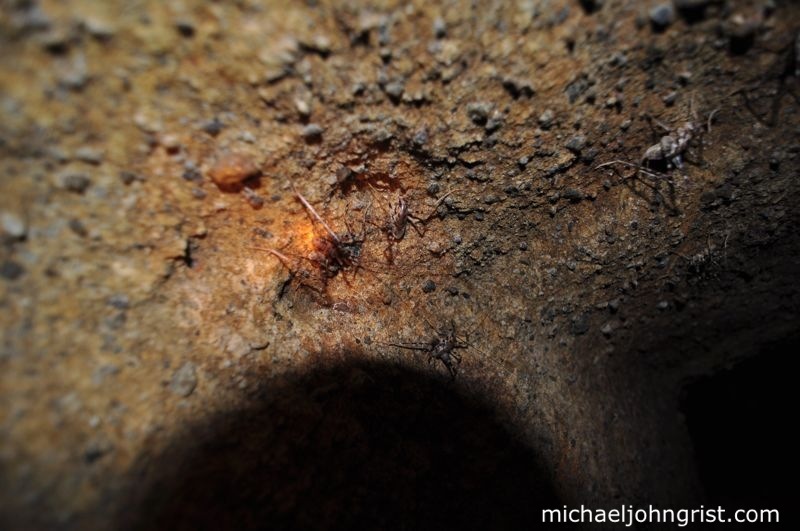 Besides cave crickets, what other creatures were in the cave? I’d be afraid of leaches hanging out in the puddles or some kind of crazy, flesh-eating, cave insect living in that place. Also, is the strawberry farm still there? Thanks for this! Alice- Absolutely, I especially love these sorts of one-man mission works of art. A real tangible feat of endurance and will that cannot fail to impress. Houma- Hi there, and thanks for commenting on my site! The courage required for this one was less about delving into the dark and more about climbing the fence and risking being caught while going in. Once inside it was very calm, and for the most part quite well lit. Strawberry farm looks like it`s gone though. the dead-end gave me chills! how amazing the top floor of something like this would have been. again, very brave of you! wow. I wish I’d seen it with its plaster frontage. As for brave, well thank you, but the ‘bravest’ thing we did was climb over the outer fence with the beady eye of an old ice-cream shop lady glancing at us. Everything after that was gravy! 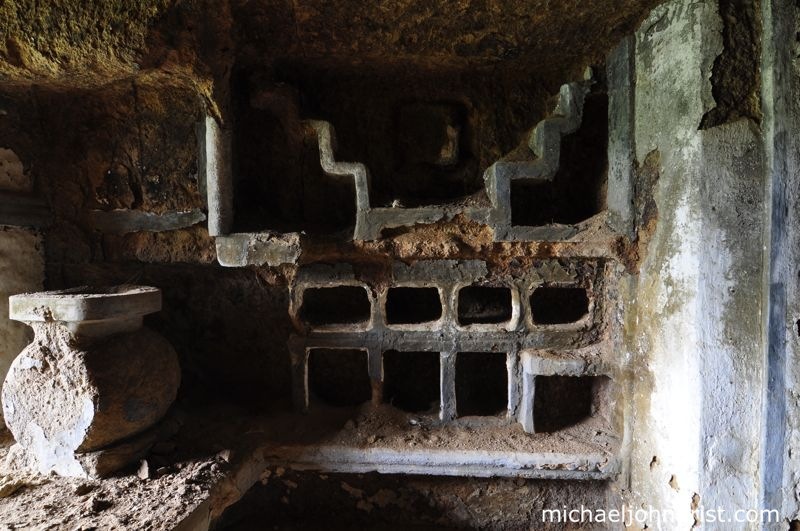 Two photo’s–shrie/kitchen–stone shelving–it is strange that you refer to the form’s seen there as you do.–I see heavy metal machine structure’s and gear work’s.It seem’s to be a heavy gun carriage framework,maybe almost “petrfied” with caked rust. Incredible! The strawberry farmer’s vision and determination are quite astonishing — to carve a hotel out of solid rock!?! The WWII tunnels must have sparked his imagination! In any case, thank you for another great article….and for sharing your adventure in such a descriptive way…..using both words and photos. Yes, it was …….a bit creepy …..but in an exciting way! I felt almost like I was actually right there with you! 🙂 Great job! Hey!! Two years ago I lived about ten minutes away from here, and always passed it when I went to the Hyaku Ana, but I never knew what it was. This is so cool!! Thank you so much for going there and sharing your experience!